Don’t get me wrong; I love being a teacher. Right now I am blessed to be working with a class of three year olds, and I am having so much fun working with them! But I have often fantasized about a different job. I love, love, LOVE to sing. And I can easily hit those high notes. Got a high A in a descent? I’m the soprano for the job. But there’s a problem. I have extreme stage fright. I hate attention. I was even worried about people looking at me as I walked down the aisle as a bride. But put me in a choir or stand me next to my sisters to sing, and I’m good to go. The nerves calm down and the butterflies flap a little more softly. Who would I like to be a backup singer for? Sting has always been one of my favorites. He works with fabulously wonderful musicians. He’s a great backup singer as well–remember “I want my…I want my…I want my MTV!”? 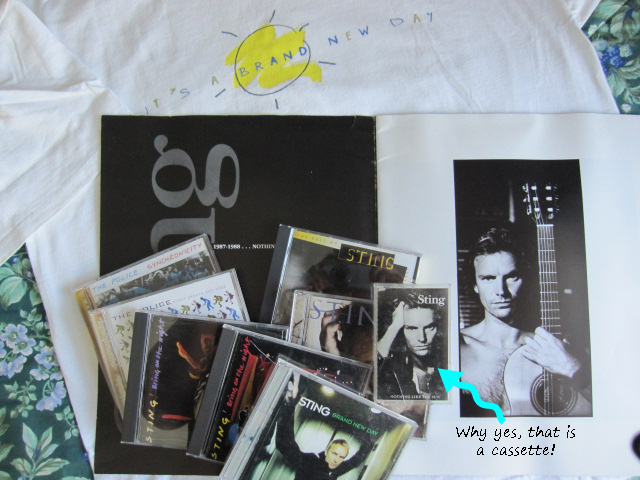 I’ve seen him two times in concert (okay, I’m not much of a groupie) and have a nice CD collection. I even have some experience going on tour! *sigh* What a great fantasy to have as I brush out hair tangles, convince Emmy to change into WINTER clothes, quiz Lily on her spelling words while feeding them both breakfast. For more perfect jobs, click over to Gretchen’s blog, Second Blooming! I think this would be a terrific job! So exciting! Well, I envy anyone who can sing period, so therefore I envy YOU! What a fun post. I must admit, being a back-up singer would be pretty awesome. And though I am not a good singer, not even close, I often substituted in music classes and the great thing was that the kids never cared how good or how bad I sang. I could just enjoy singing/teaching. And I did! If you asked me to sing in front of some adults, though, forget it!! I'm laughing over here because I was more nervous to have everyone look at me on my wedding day than to actually get married! I'm just not comfortable being the center of attention so I know exactly how you feel. Although, unlike you, I can not sing a note! I think that's an awesome dream job and great choice! Sting? Okay! At least NO one would watch you! best dream job EVER! I agree, backup singer would be the perfect job! great dream job 🙂 Karaoke anyone? So Sting would have to take you and your sister as back up singers? So cute. Actually I do notice the back up singers. I would have sang with Barry Manilow. Sting!! Oh yes. Excellent choice. Don't you just love the idea of going on tour with the boys and all those backstage shenanigans!! What a fantastic dream job! All of the fun, none of the pressure!